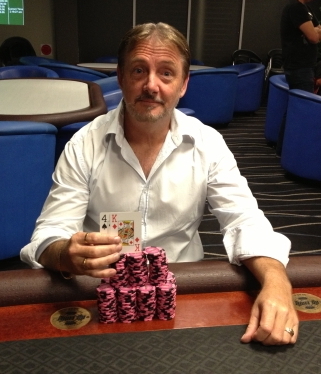 Southern Cross Poker (SCP) is celebrating a record turnout for the first edition of the East Coast Poker Championship (ECPC) of 2013 with a massive field of 212 players ensuring the $30,000 guaranteed prizepool was smashed at Diggers @ Newcastle on Sunday. With players from outside NSW joining the ECPC field for the first time, a record-breaking prizepool of $38,160 was up for grabs which included three WSOP APAC packages valued at $1800 apiece. After 14 hours of play, and more than two hours of final table action, the Central Coast’s John McCloskey (pictured) prevailed. One of the most likable characters on the circuit, McCloskey scooped the majority of the chips in dramatic circumstances. With the board showing 8-9-6-9, Ryan Nichols looked in great shape when the chips went into the middle. He slammed down 10-7 for a flopped straight, while McCloskey thought his A-8 was drawing dead. He was mistaken, as a third 9 on the river gave him a full house! Nathan Beavan finished in third place, securing his place on the Southern Cross team heading to the WSOP in Melbourne in April. It was a great effort by Nathan to finish in the top three as he struggled to remain awake in the latter stages of the tournament. Craig Lowe was the best of the team from Queensland finishing in fifth place while Adam McClure cashed in 17th. 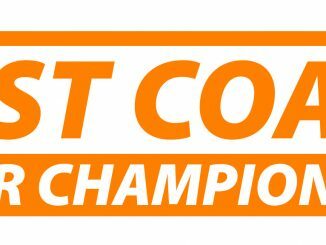 Dual ECPC winner Brenton Nichols once again finished a credible 12th, with Scott Clarke also earned another ECPC cash in sixth. It was a great day for the Central Coast crew obviously Ann Puch and Chris Murphy joining John McCloskey in the money while Bruce Burnham led the North Coast players by example to finish seventh. Bruce was a massive chip leader throughout the middle stages of the tournament but ran card dead when it counted most. 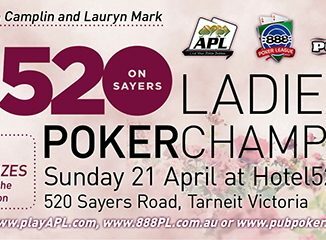 • For details of Southern Cross Poker’s new Tournament of Champions promotion, click here.